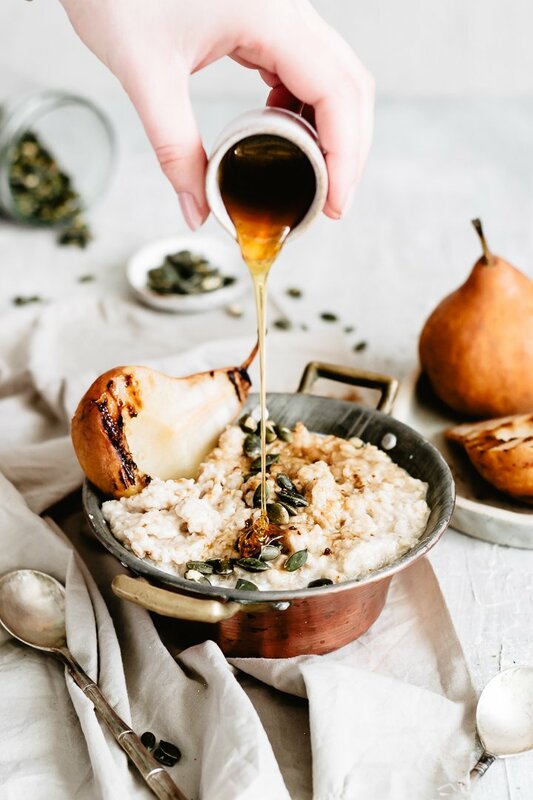 A delicious and healthy breakfast for you: ginger pear oatmeal with chestnut honey! Very often, when I write the introduction to my posts, I feel like I’m talking to a virtual sister. So, dear sister, if you’ve been reading me for a while you should know that one of my favorite breakfast EVER is …mister Oatmeal! Why?! Because it’s both healthy and tasty, and delicious, and yummy. And OMG, have you tried it yet?! Ok, ok, let’s fix the “damage” then. This ginger pear oatmeal is seriously one of my favorite oatmeal that I’ve been doing lately. Now, honestly, it’s like when I try a new granola: I think that ‘this’ is better than the ‘previous’ one, but it’s actually so difficult to choose. 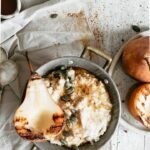 When I created this recipe I absolutely wanted to give it a twist: didn’t want the same “boring” (in a manner of speaking) pear oatmeal. So, what was the first step to take? Grill those pears, friend! When grilled, pears slightly caramelize and their flavor is even better. Then what? Oh, add some ginger powder! Have you ever tried ginger-pear combo? You’re missing out on this, make sure to try it! Lastly: that perfect sweet touch given by the honey, chestnut honey in my case. I’m not sure this kind of honey is popular elsewhere, but if you find it please give it a shot. Its flavor is incredible, intense and unique! You won’t like it, though, if you usually prefer mild-flavored honey. Enough with the words. You’re here to try this ginger pear oatmeal, aren’t you? Then let’s go! 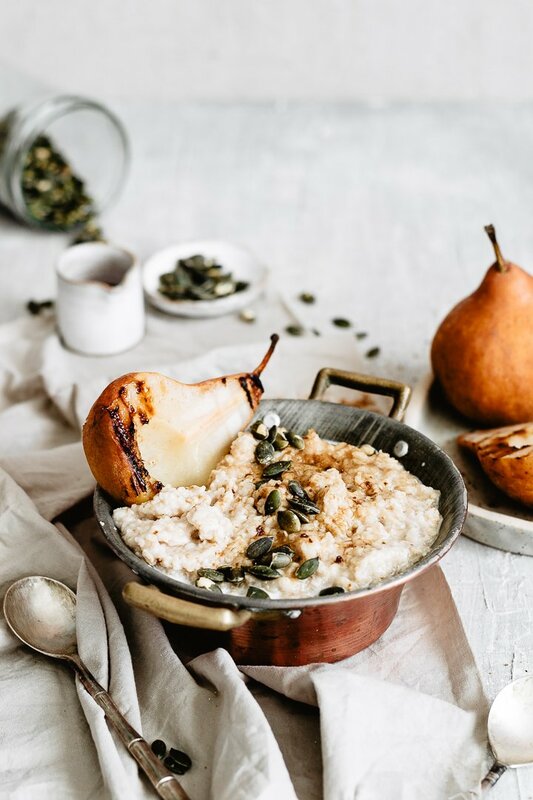 A delicious and healthy breakfast for you: pear oatmeal with ginger and honey! Make sure to read this article to be able to make the perfect oatmeal! 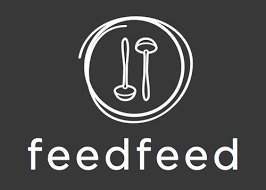 Measure all your ingredients then put oats and salt into a pan or pot, pour the water and bring to a boil at medium low heat. After a minute or so, add vanilla extract. Remember to stir often. In the meantime, wash your pears and cut them in half. Heat a cast iron grill pan, then grill your halves until slightly caramelized. When the oatmeal is nice and creamy, add ginger powder and stir. 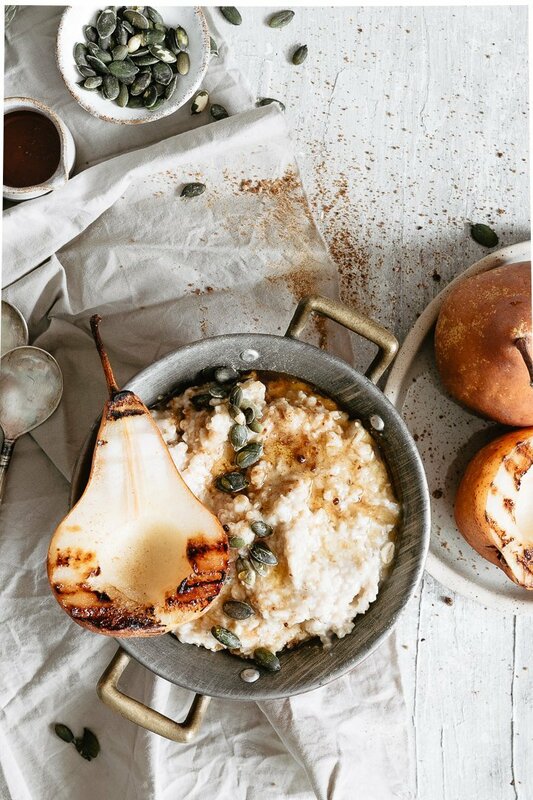 Serve your oatmeal with the caramelized pear and honey (and seeds if you want). Happy breakfast! If you prefer you can slice your pear.